Home » Blog » Introducing the Conductor REST API, AJAX Widgets, front-end Filtering, and more! Version 1.5.0 of Conductor ships with a REST API! The Conductor REST API provides API endpoints for Conductor which allow developers to interact with sites remotely (i.e. via AJAX requests). We have some initial documentation to help explain how the Conductor REST API works. We’ve also introduced a new Conductor option to enable or disable the Conductor REST API entirely. You can find this setting in Conductor > Options in the WordPress admin. Conductor Widgets now support AJAX requests for querying content. This means that, when navigating from page to page in a Conductor Widget for instance, the widget can make an AJAX request to the Conductor REST API and load the content within the widget container instead of reloading the entire page. Anyone who is familiar with the Customizer will likely recognize this behavior. 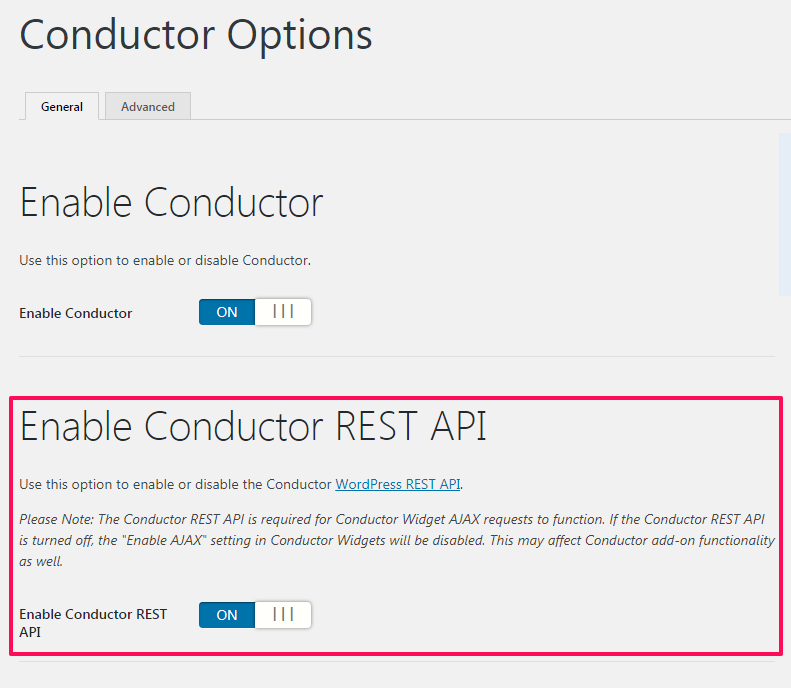 We’ve introduced a new setting called “Enable in REST API” to Conductor Widgets. This setting allows individual widgets to either be enabled or disabled in the Conductor REST API. If this setting is unchecked, that Conductor Widget will be disabled in the Conductor REST API. This setting is located in the “Advanced Settings” section of Conductor Widgets. Use this setting for more granular control of your Conductor Widgets. The Small, Medium, and Large Conductor Widget displays are now deprecated. Previously we had mentioned that these displays were considered legacy as of version 1.3.0. Note: The Column display was labeled as “Custom” in Conductor version 1.3.0. Small: The Columns display will be utilized on the front-end with the number of columns set to 4. Medium: The Columns display will be utilized on the front-end with the number of columns set to 2. Large: The Columns display will be utilized on the front-end with the number of columns set to 1. When a Conductor Widget is saved/updated, the Column display will be set as the new display (unless another display is selected) if that widget previously had a legacy display selected. Perhaps the biggest (and best) part of this round of updates is our newest add-on, Conductor Filtering! This brand new add-on allows users to filter content displayed in your Conductor Widgets to narrow it down to their desired results. The Conductor Filtering add-on currently supports filtering for registered taxonomies. Any content type, when selected for use in a Conductor Widget, that has a registered taxonomy attached to it can have filtering enabled. When filtering is enabled on a Conductor Widget that does not have any pagination, jQuery Isotope is used for smooth on-page filtering. For Conductor Widgets with pagination, the Conductor REST API is used via AJAX requests. This is a great addition for news sites, portfolios, or even your own personal blog! We can’t wait to see what you’ll build with it! We also have some other notable updates that we’d like to highlight. In Conductor Widgets, we’ve added HTML wrapper elements to the different sections (e.g. content and pagination). These wrapper elements were added as a result of the new Conductor REST API. We also fixed a bug where global $post data was not reset in some cases after a Conductor Widget was displayed. Our Custom Fields add-on received some updates as well. It’s now easier to add custom fields as output elements to your Conductor Widgets. You will no longer have to search for custom fields (though you still can). The list of available custom fields is displayed when the custom fields input element is focused. We also fixed a possible fatal PHP error that occurred due to Yoast SEO removing all widget_init hooks on the sitemap endpoint. Our Gravity Forms add-on will now utilize the current date format stored in settings when displaying date fields. Our Ninja Forms add-on will also now utilize the current date format stored in settings when displaying date fields. We also fixed a possible fatal PHP error due to missing parameter in NF_Database_Models_Submission::get_sub_date() when the sub_date custom field was used as an output element in Conductor Widgets. In the Query Builder Add-On, we’ve improved usability in the shortcode query builder module. We also added “Edit Query” helper buttons for logged in users on the front-end to easily navigate to the edit query page. The “Edit Query” buttons will appear after the query title as well as after the query. Along with the above improvements, we fixed a bug where the FROM query argument action buttons were not visible in some cases which, in-turn, did not allow other query arguments to be added to a query. We also fixed a few possible PHP notices as well as a possible fatal PHP error that occurred due to Yoast SEO removing all widget_init hooks on the sitemap endpoint. We fixed a bug in our User Profiles add-on where the User Profiles custom fields were not displayed in the Custom Fields add-on list when a User Profiles post type was selected. We’ve added WooCommerce 3.0+ support to our WooCommerce add-on. We’ve also added logic to utilize the woocommerce_template_single_excerpt() function when displaying the excerpt (WooCommerce calls this the Short Description).